Los Angeles, CA – Described by actor and screenwriter L.M. Kit Carson as “It’s a Wonderful Life meets The Twilight Zone,” the spellbinding thriller, DOONBY, is set to be released on DVD July 22nd by Green Apple Entertainment and Riverhorse Entertainment. Written and directed by Irish filmmaker Peter Mackenzie, Doonby examines how much one man’s life can affect those around him while answering thelarger question of what one life is worth. Doonby tells the story of Sam Doonby, a mysterious drifter who quickly becomes the talk of the small Texas town. He finds work at Leroy’s Country Blues Bar, where his musical talents make him a local celebrity, attracting the attention of the beautiful but spoiled Laura Reaper. Sam is strangely immune to the misfortunes of others, yet always around to prevent sudden disasters from happening. Soon the narrow-minded townsfolk become jealous and start to question his background and motives. But, it is Laura’s doubts that cause Sam to vanish, leaving the locals to deal with some difficult admissions. Sam’s abrupt disappearance forces those he left behind to deal with some painful revelations and to question his mysterious arrival and departure. Starring John Schneider (The Haves and the Have Nots, The Dukes of Hazzard, Smallville) as Sam Doonby, alongside Will Wallace (Tree of Life, The Thin Red Line), Robert Davi (The Expendables 3, The Goonies, Die Hard), Ernie Hudson (Ghostbusters), and Jenn Gotzon (Hulk, Frost/Nixon), Doonby is produced by Riverhorse Entertainment. 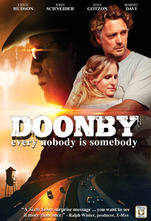 Beginning on July 22, the DVD release of Doonby will be available online through outlets such as ChristianCinema.com, big box stores such as Best Buy, and at brick and mortar Christian retail outlets such as Family Christian Stores. Doonby is presented in widescreen with an aspect ratio of 16 x 9 (1:78) and Dolby Digital Surround Sound. Riverhorse Entertainment Ltd. is an Irish production company owned by husband and wife team, Peter and Sally Mackenzie, with offices in the United Kingdom and Texas. Founded in 1990, Riverhorse Entertainment develops feature projects and live stage productions. Doonby is just one of ten projects that they have in their portfolio. Other current features include Finklestein’s Miracle, a comedic tale of redemption, and The Wedding Present, a paranormal thriller set in New Orleans. Green Apple Entertainment is a leading international distributor of quality, independent entertainment on DVD, Blu-ray, download and streaming platforms and cable VOD. Headquartered in Boca Raton, Fla., Green Apple works directly with filmmakers to cultivate superior filmmaking for a variety of genres – including action, drama, romance, thrillers, horror/sci-fi, documentaries, family and animation – and fresh new viewing experiences for a diverse array of audiences. Green Apple was founded in 2005 by industry veteran Tim Warren. For more information, please see http://www.greenapple-ent.com or follow on Facebook at www.facebook.com/GreenAppleEnt.